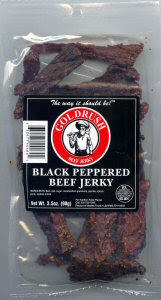 Gold Rush Black Peppered jerky comes in a transparent, narrow plastic package that allows clear visibility of the product. The label is black with white lettering and has a logo depicting a gold miner. The packaging is professional in appearance but not overly distinctive. Unlike many reviews that we have done in the past, the aroma of this jerky is a direct parallel to the taste. The meat is redolent with the aroma of pepper, and that is a wonderful thing. 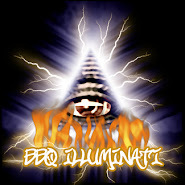 I enjoy exotic and arcane aspects to sauces and jerky’s but sometimes you are most satisfied with the basics. Before you take your first bite you know that you are getting something primal but well crafted. doesn’t impact the texture and taste, I don’t care. 1) 97% fat free. Good to know and nice, but not surprising. 2) Moist and tender. Right on the nose (not literally). This jerky is surprisingly moist. Some jerky’s are brittle and some are overly chewy. This finds a nice middle road between the two. 3) The jerky is black peppered. Rarely has a description seemed so accurate. It was bit surprising that the black pepper isn’t even listed in the ingredients. The sixth ingredient is ‘spices’, which I guess would include the pepper. Regardless of how they pull off this bit of gastronomical alchemy, the result is an excellent jerky with strong overtones of black pepper. The strongest profiles found here are meat, salt and pepper; offering a simple yet satisfying eating experience. I was concerned about the msg that is the fourth ingredient, but it was nearly undetectable. An tasty, low carb snack; Gold Rush Black Peppered Jerky would have an honored place in my pantry if I hadn't eaten the entire package. Time to order more.